The hippopotamus, or hippo, is native to sub-Saharan Africa and is a large, mostly herbivorous mammal. The name hippopotamus comes from an ancient Greek word that translates to mean ‘river horse’ and the hippo is the third-largest land mammal following the elephant and rhinoceros. Predators: Crocodiles, lions & hyenas can prey on baby hippo. Adults, don’t generally have predators. The hippo can be found in lakes, rivers and mangrove swamps. Territorial males will control a pre-determined stretch of water which will include a group of five to thirty females and their young. The main reason why hippos are often found near bodies of water is that this is how they stay cool. During the hot daytime a hippo will either stay in water or mud in order to cool down. Childbirth also takes place in water as does mating. Hippos may be seen near each other at rest, but feeding is done in solo and they are not territorial on land. The hippo generally grazes after dusk when it is cooler. They are characterized by their barrel-shaped torsos. The hippo mouth is wide and open which contains large canine tusks. They have bodies that contain little hair, short columnar legs and can weigh up to 3,300 pounds for males and females are slightly smaller at 2,800-pounds. 1. Despite their appearance, the Hippo is not to be messed with. The Hippopotamus is one of the most dangerous animals in the world, believe it or not. This is based on the fact that they are extremely aggressive and unpredictable. 2. There are five subspecies of hippos. The five subspecies of hippos are descriptive of the shape of their skulls and where they are found geographically. The subspecies include the Great Northern Hippopotamus (also known as the Nile Hippopotamus), The East African Hippopotamus, the Cape Hippopotamus (also known as the South African Hippopotamus), the West African Hippopotamus (or Tchad Hippopotamus) and the Angola Hippopotamus. 3. As hippos can be traced back about 52-million years ago, a few species of the large mammal are extinct. A total of six species of Hippopotamus are extinct with three of them being subspecies of the Malagasy Hippopotamus. These species were much smaller in size than the modern hippo with the last of them disappearing in the past century. There are also three species of the European Hippopotamus that have become extinct. 4. Male Hippos are larger than the females. Adult male hippos can weigh about 3,300-pounds with females reaching 2,800-pounds. Very large males can grow to 4,400-pounds with exceptional large ones reaching 5,800-pounds. 5. Hippos, despite their size and shape, are fast. A hippo can gallop up to a speed of 30 km/h on land although they typically trot. In water, it is a slightly different story. Although they have webbed feet, Hippos are not very good swimmers and they can’t float. The hippo moves slowly and purposely in water and is rarely seen in deep water. When this happens, it will take porpoise-like leaps to move about. The ears, eyes and nostrils of the hippo are placed high in the shape and construction of its head which permits these organs to be above the water while the rest of the body is underwater. 6. A Hippo can live to become a senior citizen. The average lifespan of a hippopotamus is between 40 and 50 years. However, the oldest living hippo in captivity set a record when she died in 2012. Donna was a resident of the Mesker Park Zoo in Indiana. At the time of her death she was 61. 7. When you are a Hippo, sometimes size really does matter. 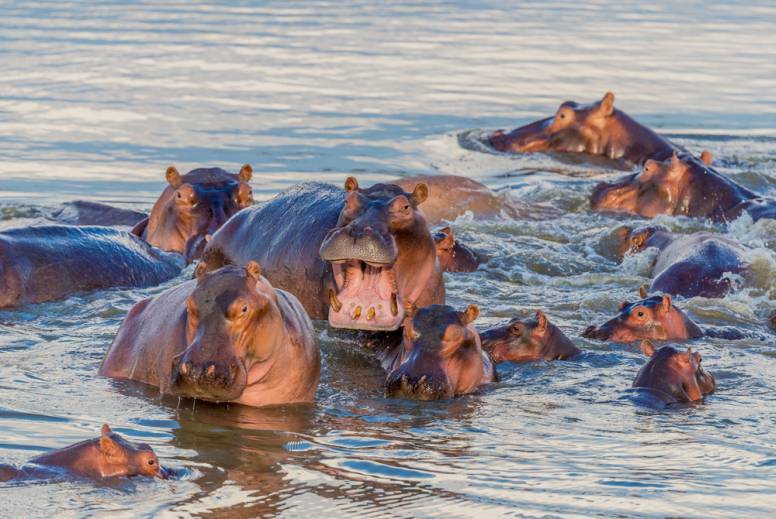 Hippos are known to co-exist with several predators. Lions, spotted hyenas and Nile crocodiles will prey on young hippos. However, due to the massive size of adult hippos, these animals will generally leave them alone. There have been incidents where large lion prides have been successful in taking down an adult hippo but these are infrequent. 8. Reproduction takes time when you are a hippo. The female hippo reaches sexual maturity between five and six years of age. They have a gestation period of eight months. Males reach sexual maturity by the time they reach 7 or 8 years of age. Mating takes place in the water with the female under water during most of it. Once pregnant, the female will seek isolation until after the baby is born and will return about two weeks later. The baby hippos are born underwater and will weigh between 55 and 100-pounds and will be about 4-feet long. They must swim to the surface in order to take their first breath of air. A normal birth rate is a single calf but twins are not uncommon. Mothers are very protective of their young and calves are often left together in ‘nurseries’ which are usually watched by one or more adults. While in these nurseries, the baby hippos will engage in play fights which prepare them for when they must fend for themselves. Weaning will begin at six or eight months of age as is complete by their first birthday. 9. Hippos use their body waste to mark their territory. When marking territory with feces, the hippo will spin their tail and it acts as a fan to spread out the marking material. This essentially allows the hippo to mark a large area at a single time. The ‘yawning’ that Hippos often display is actually meant to be a threat. 10. Hippos bite when they fight. When engaged in a fight, a male hippo will block an attack with his incisors. But when he wants to inflict injury, that hippo will use his canines. There is also a fair deal of communication that can be distinguished between hippos fighting and non-fighting. They will typically use vocal sounds such as grunts and bellows. Researchers believe that some of the sounds that a hippo will use become part of an exercise in echolocation – much the same way bats use it – however, it is still unclear as to why a hippo would use echolocation.